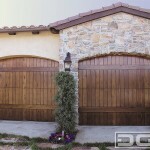 The Tuscan Renaissance Garage Door Collection is a rustic historical style composed of some of our most highly acclaimed Tuscan garage door designs. 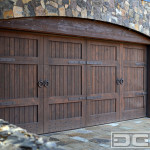 Often times our Tuscan garage doors are handcrafted in naturally aged vintage woods or high quality woods that we hand distressed with techniques which might include wire brushing, hand-hewing and other unconventional techniques that add rustic, timeless beauty to each custom garage door design you'll find in our Tuscan style collection. 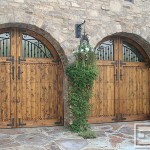 Authentic decorative iron-forged hardware such as ring pull knockers, iron studs and rosettes are freely used to accentuate that old world European style our Tuscan garage doors are known for. 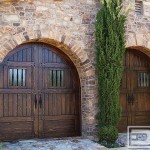 Most historical homes in the Tuscan countryside were artistically built out of natural elements found in the region that blend in well with the natural environment. 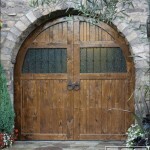 Since these Tuscan homes are mostly stone structures, the architectural elements that give these homes a warm, homely inviting feel are the wooden features, entry doors, shutters, windows and garden gates. 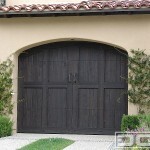 Our Tuscan style garage doors are exquisitely designed to parallel this warming effect by manufacturing our wooden garage doors much in the same fashion these old world artisans would craft their own doors. 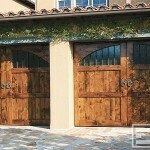 All of our garage doors are uniquely designed to capture the home's authentic style while keeping within the boundaries of the real doors and gates found throughout Tuscany. 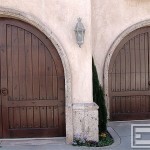 Picture your Tuscan Style Home with authentic Dynamic Garage Doors custom-designed and handcrafted to accentuate the features that make your home a true Tuscan retreat. 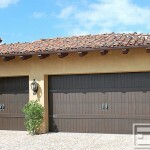 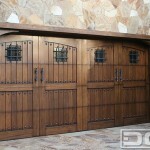 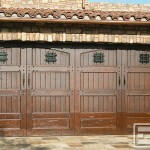 Let our wooden garage doors soften the harsh rock walls used in Tuscan Style Homes. 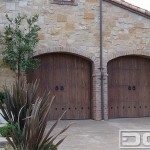 Each one of our garage doors are designed to soften the appearance and reaffirm the warm and inviting homes of the Tuscan Countryside. 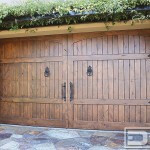 Let the splendor of uniquely handcrafted garage doors welcome you home at the push of a button when conveniently paired with automatic activating devices.